The field of evolutionary ecology, which applies Darwinian natural selection theory to the study of adaptive design in behavior, morphology, and life history, has produced substantial advances in understanding human evolution and prehistory. 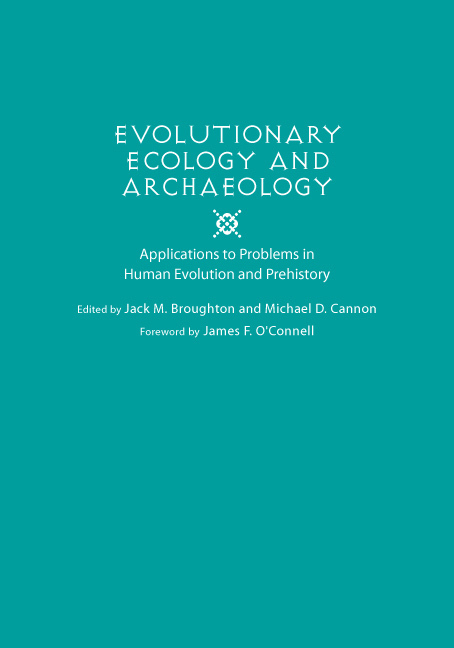 Editors Jack Broughton and Michael Cannon have compiled archaeological and paleoanthro- pological studies that provide a foundation for sustained development of the study of the human past. This volume’s broad range of research will foster sustained development of evolutionary ecology, and like Darwin’s work nearly 150 years ago will open wide fields of understanding of human prehistory. Michael D. Cannon is a principal investigator with SWCA Environmental Consultants in Salt Lake City, and an adjunct assistant professor in the University of Utah Department of Anthropology. His research focuses on past environments and the ecology of prehistoric human subsistence in North America, particularly in the Great Basin and the Southwest.